Suspect by whom? Maybe by certain individuals, but not suspect by the authority of the Roman Church, who did so. Another feast for the eyes...thank you so much. 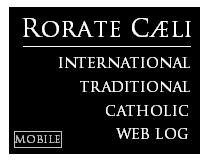 So- what can I say - CATHOLIC! I only got as far as St. Joan of Arc will look at the rest later on ..
Don't you know that Our Blessed Lord changed His mind and now sanctions Catholics actively participating in pagan rituals and inviting those same pagans to perform their rites in places consecrated to Catholic worship? So, I have no qualms about the imminent canonisation of Pope John Paul II knowing that Our Lord doesn't get so hung up on things like the First Commandment any more. "Why is JP II, among the most disastrous popes in the history of the Church and whose beatification is suspect, included in this glorious collection?" Now we just need to see the ones of John XXIII and Paul VI, to make the unholy trinity complete. The destroyers of the Church and of the Faith, and therefore ultimately enemies of all Catholics trying to save their souls. Such accomplishments certainly require some "heroic virtue". Other than that, great videos. Thanks for posting them. I believe even Cardinal Martins in charge of the beatification of JP II admitted his papacy was ignored, only his heroic virtue concerning his interior life was considered. No wonder they did because his papacy holds objective photographic and written evidence that militates boldly against any such move. Here's a good read, among many others about the entire case which honestly smacks of Post-conciliar politics. Christian Order wrote a good one as well. Significant too they want to beatify the homosexual Pope Paul VI whom Padre Luigi Villa has written excellently referenced materials against any such manoeuvre. he has also condemned moves to have John Paul II canonised. However, having dies not long ago, the liberal modernists in Rome feel emboldened to do the unthinkable with the pope who started off the entire postmodernist demise of Catholicism worldwide. I was reading a mainly NO blog the other day and found it quite a turn up for my collection of files that most respondents doubted the validity of rushing into this process based on all the revelations about Vatican maladministration; criminal cover-ups and papal appointees during John Paul II's pontificate. "I believe even Cardinal Martins in charge of the beatification of JP II admitted his papacy was ignored, only his heroic virtue concerning his interior life was considered. No wonder they did because his papacy holds objective photographic and written evidence that militates boldly against any such move." Only the heretics to come with such a preposterous idea. A pope can not be a saint if his papacy was a disaster and his actions caused great harm to the Faith and Church (and to souls). First and foremost one must do the duties of one's vocation and state of life... so whether his interior life had any heroic virtue or not is wholly irrelevant here. I think the pontificate of JPII had some real misteps. But it is also clear that the harsh and rash judgments of some trads are not pleasing to Our Lord, and in many ways show a shallow appreciation for what canonization means. See: rash judgment, Catholic encyclopedia. LeonG, I believe in the magisterium of the Church, not the magisterium of nun, the magisterium of questionable mystics, and especially do I not believe in the magisterium of lay traditionalist apologists. I think the pontificate of JPII had some real misteps. These "missteps" include acts which the Church has judged as intrinsically immoral such as the active participation of a Catholic in non-Catholic worship (Togoville in 1985) as well as inviting pagans to perform their rites in building consecrated to Catholic worship (Assisi in 1986). This crisis in the Church is worse than just a crisis of faith. Would that it were: then we could reason together on the basis of Scripture, Tradition, and the Infallible Magisterium. This, however, is a crisis of reason in that the principle of non-contradiction is trampled underfoot and, thus, there is no basis left for rational argument. It's as if some dark miasma has settled on the minds of Catholics that reason cannot pierce. Whatever proof texts from the sources of Revelation are brought forward that demonstrate that at the very least what Pope John Paul II did is at odds with the Catholic faith this pestilent cloud remains. Frighteningly, it's like talking to someone who belongs to a cult: reason prostrates itself before the personality of the leader. yes Pope St Pius X had plenty to record about liberal modernism and Pope St Pius V anathematised the liturgical revisionsim that we have witnessed since 1969. Canonisations based on a hollowed out process since 1984 are indeed highly politically suspect. 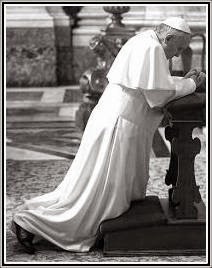 Beatifications are nothing to do with the church's magesterium being administrative acts of a pope leading perhaps onto the next stage of the process. While one would expect candidates for canonisation to be thoroughly investigated for being sound models of the Roman Catholic Faith for us to imitate this is no longer such a simple consideration. Everything in this liberal modernist church has to fit the Vatican Two paradigm of fabricated vernacular ecumenical liturgical praxis and liberal pastoral processes. The modernist church no longer follows a pre-conciliar model of Catholicism as such. With the canonisation process also radically altered in its emphasis from 1984 it is patently obvious that the process bears little resemblance to the one that successfully governed it certainly from 1234 and from the additions by Pope Urban VIII in 1634. Pope John Paul II actually wanted the procedure considerably streamlined which he managed to do by 1983. Illustrative of the personalisation of his papal role and his own interpretation of faith he even wanted the victims at Auschwitz proclaimed martyrs regardless of who they had been. This is a significant perspective on his part revealing how he construed the concept of martyrdom ecumenically and interconfessionally. When catholics cry magesterium today one is forced to ask oneself according to which paradigm - liberal modernist (condemned as the enemy within the church by Pope St Pius X) or according to what we are constrained by prevailing ecclesiastical circumstances to call traditional or orthodox? At one stage in his pontificate Pope Benedict XVI had to remark about the lack of proper attention to beatification and canonisation procedures. Considering the total numbers 1450 of both by John Paul II and a massive 888 (by end February this year) by Pope Benedict XVI, it is easy to see that the process is not only easier but also has a Fordist look about it. Thankfully, we are not obliged to pray to "saints" for our salvation.